Gateway to The Great Barrier Reef and home to Daintree National Park, sites so breathtaking they rank on the World Heritage Convention’s list as two of the the most unique and precious places in the world. Located on the coastal band between the heavily forested mountains of the Great Dividing Range and the crystal clear waters of the Coral Sea, Cairns is one of Australia’s fastest growing cities. 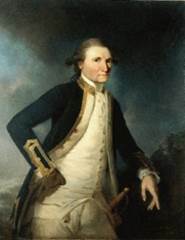 Discovered by English explorer Captain James Cook in 1770, but the rough terrain and difficult environment kept it from being settled for another 100 years. When gold was discovered nearby, a mining camp was set up. The city, named after the governor Sir William Cairns in the 1870s, grew up to become a major exporter of sugar cane. What is left of the massive sugar plantations can still be seen along the coastline. 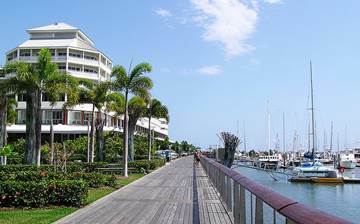 In a fairly short period of time, Cairns matured into a modern metropolis, a first class seaport and a significant big-game fishing centre. From its Aboriginal beginnings to its rise as a global exporter, art galleries house both indigenous and contemporary work that illustrates Cairns’ history and its rich, varied culture. Cairns top class chefs serve up Australian “bush tucker”and ethnic cuisines from around the world, tailoring their recipes just enough to make them their own. Nearby wineries concoct epicurean wines from the tropical fruits that flourish in Cairns’ sultry climate. Cairns is Australia’s jewel; a real-life tropical paradise. Residents match the city’s warm climate with their equally warm hospitality. They welcome the adventurous as well as those searching for a bit of peace and relaxation. Its pristine beauty, natural wonders and distance from larger cities has made Cairns one of the most popular destinations in Australia for international tourists and the most desired getaway for domestic holiday seekers.